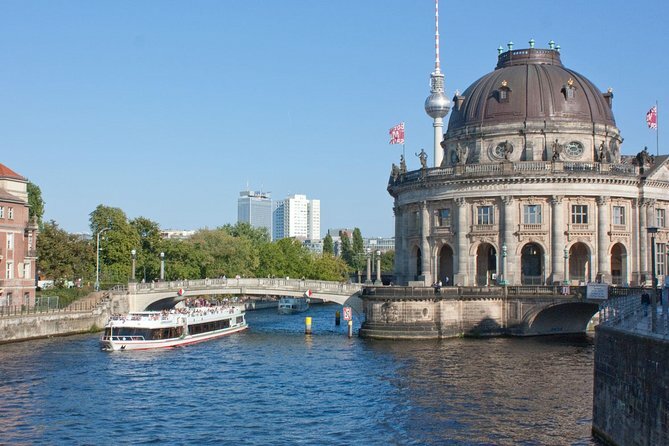 During this trip you will see all the main sights of the city between the Charlottenburg Palace in the West and the East Side Gallery and Oberbaumbrucke in the East of Berlin whilst enjoying a delicious 2-course lunch with a drink! Berlin's waterways offer the unique possibility to discover the inner city and its sights from the water. During this trip you will see all the main sights of the city between the Charlottenburg Palace in the West and the East Side Gallery and Oberbaumbrucke in the East of Berlin whilst enjoying a delicious 2-course lunch with a drink of your choice. Each participant can choose the main course individually. Dessert will be the same for all participants. The menu for groups with less than 20 people does not have to be chosen in advance but can be communicated to our staff only on board of the boat. Operates: The cruise runs daily from the 8th of April until the 29th of October at 10:00AM and 2:00PM. The menu does not have to be chosen in advance but can be communicated to our staff only on board of the boat. Please discuss with our staff on board if you would like the meal to be served at the beginning of the cruise in the morning or rather towards the end closer to lunch time.